The Kampa Folding Camping Side Table is the ideal height for drinks/snacks when sitting on standard height camping chairs and folds down to a compact size for storage. The Camping Side Table utilises a convenient folding and lightweight design to allow for the table to be easily set-up as well as taken down. 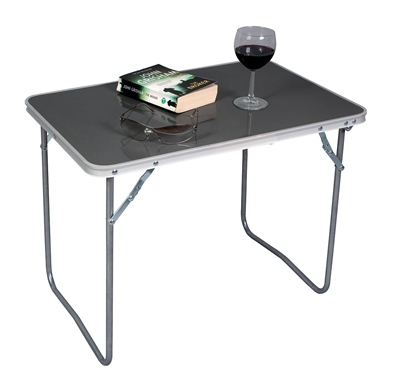 The side table has a lightweight aluminium frame with an easy clean granite-look table top and carry handle. Love this table, perfect for putting the Gin and Tonic on when sitting outside or anywhere for that matter. Light to pack but sturdy. Just bought another. I use this as a laptop table while sitting on the floor as it gives just the right screen height. Light, portable and seems sturdy. I love this side table. It's the perfect height for arms reach coffee and drinks while sitting in your camp chair.